A nuclear functional study, sometimes referred to as a wall motion study, gated nuclear angiogram or MUGA scan, is a nuclear medicine test used to assess the heart’s pumping function. Example of short-axis fractional blood volume (A and C) and ATF (B and D) images obtained from 15O-CO (A and B) and fitted blood volume fraction (C and D) images of same patient. Images were obtained using stand-alone PET scanner and 10-mm gaussian filter. 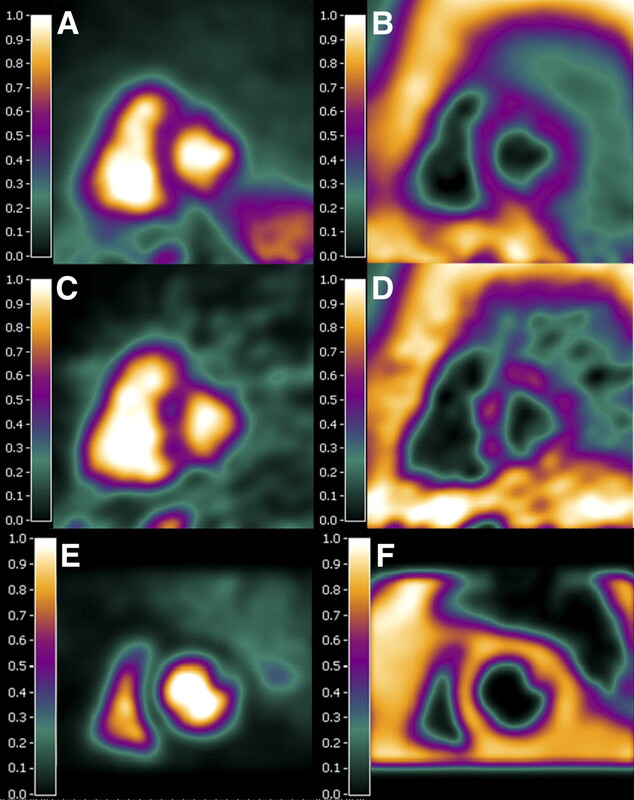 Also shown is example of short-axis fractional blood volume (E) and ATF (F) images obtained using clinical PET/CT scanner and fitted blood volume fraction images. The nuclear functional study is most often used to measure the function of the left ventricle (LV), which is the major pumping chamber of the heart. The LV receives blood from the lungs and pumps blood to the rest of the body. The wall motion study is more accurate than echocardiography and cardiac catheterization in measuring the pumping capacity of the LV. The test is also the best way to measure the ejection fraction (EF) of the heart, or the percentage of the heart’s internal blood volume that is ejected with every beat. The EF is a very important measurement and one of the best prognostic indicators for heart disease. How is a Nuclear Functional Study Performed? For the test, the patient’s own red blood cells are tagged with a radioactive material called Technetium (Tc-99m) and then injected back into the bloodstream. A gamma camera detects the radioactive red blood cells as they circulate through the heart and measures the timing of cell movement during the contraction and relaxation phases of the heart. The images and information provided by the wall motion study help assess the size and strength of the LV. Abnormalities in localized areas of the heart usually indicate heart muscle damage from coronary artery disease. A generalized weakness of the heart muscle suggest other conditions such as hypertensive heart disease, valvular heart disease or cardiomyopathy.